The situation in Papua New Guinea's capital remains tense after a day of unrest when police opened fire on students at the University of PNG. The students had planned a rally at parliament to show their support for a vote of no confidence in the government, which was expected to be tabled in the house today. 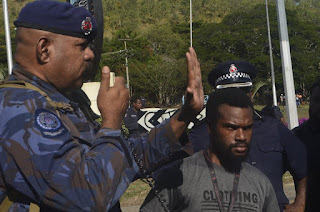 They have been boycotting classes and protesting for over a month, demanding that prime minister Peter O'Neill stand aside to face fraud allegations. The morning's events quickly spiralled after police stopped students from leaving their campus . 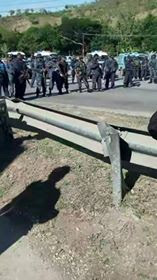 Tensions boiled over and some police started shooting, according to one of the student leaders at the University of PNG, Gerald Tulu Manu-Peni . "There was no warning shots, they fired straight at us. We were just five to ten metres away from them," he said. "We took cover in our dormitories. They fired tear gas into the dormitories, they fired shots into the dormitories." Early media reports centred around claims that up to four people had been shot dead. Both the government and the police force deny this. An MP and the Governor of Oro Province,Gary Juffa, was down at the campus trying to mediate between the police and students. "The students at times were a little rowdy and loud, I guess. But you know, that can be understood by the fact that some of them had just been shot," he said. "They felt aggrieved. But the police felt also that there was on the part of the students intimidation or some provocation. So there is a situation that does give rise to tension. "University of Papua New Guinea students gather to discuss their demand for the prime minister's resignation. The Police Commissioner Gari Baki said 23 people, believed to be university students were injured in the confrontation and that they were taken to Port Moresby General Hospital and the Gerehu St John's Hospital. This evening, the head of the Accidents and Emergency Ward at the Port Moresby General, Sam Yokopia, confirmed that five people were in a critical condition. 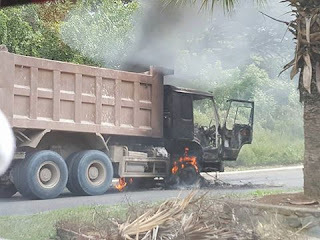 However, unconfirmed reports continue to filter out from the PNG capital saying at least one of the victims has died since being hospitalised. Social media reports indicate large groups of citizens in Port Moresby have been expressing their dismay at the unrest and reported deaths. The Prime Minister meanwhile has blamed the parliamentary opposition and who he calls agitators outside the student body for the unrest and the protests of recent weeks. "The people behind these protests have political agendas," said Mr O'Neill in a statement. "Members of the Opposition have been engaging with students, and have been encouraging them to pursue Opposition demands... and calling on me to step aside." Announcing an inquiry into the unrest, the prime minister warned that those found to have committed criminal acts would face the full force of the law. "Opposition Members even made claims inthe National Parliament that students were killed when they knew this was false," he said. "The blood of the injured students is on the hands of those members and their supporters." Meanwhile, the police chief has sought to deflect the blame for the unrest towards the students.Gary Baki claimed that after being refused permission to hold their rally by the police, students responded violently by stoning the policemen who fired several shots into the air to disperse the students. In a statement, the commissioner said police had to deal with a "large crowd armed with machetes, bows and arrows and home-made guns". Parliament has been adjourned until August by the acting speaker Aide Ganasi, due to concerns about the security situation in the capital. The speaker of Parliament, Theo Zurenuoc, who's currently serving as the Governor General, expressed disappointment that in his absense fromthe house, parliament did not deal with the issue behind the unrest. "I am quite disappointed that the parliament has adjourned," he said. "I felt that we should have adjourned for one or two days to assess the current situation and maybe reconvene to address the issues at hand." Mr Zurenuoc admitted that he had not expected the situation in the capital to escalate like it did today. "My view was that some of the pressure should have been defused in parliament. I think that's the appropriate avenue for all concerns of the people of the nation to be dealt with." He said that if the Peter O'Neill-led government felt it had the majority support in the parliament, it ought to prove that on the floor of parliament.Gary Baki said police in other parts of the country have had to attend to some smaller public disturbances that occurred in the wake of the unrest in the capital. The Oro Governor Gary Juffa pointed out that the students who had been fired on in Moresby often come from theprovinces where news of today's violence and police handling will be disseminated quickly. "If there are any deaths then certainly there will be some tension, repercussions," he warned. A lengthy adjournment of parliament appears to have saved Peter O'Neill from facing a motion of no-confidence, but calls for him to resign are unlikely to recede. 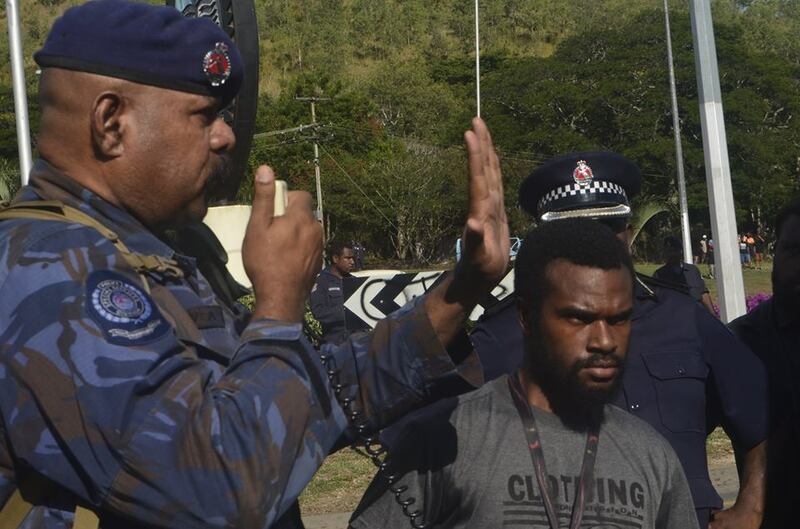 And while police say they have restored calm in Port Moresby, public outrage about police firing on students means the chances of more unrest remain very real. Meanwhile, Port Moresby Police have confirmed in a statement that there are no deaths of any UPNG students from the confrontation this today. Police are calling on individuals , social media users and media organizations to be responsible and refrain from releasing unsubstantiated information. Commissioner Baki has called on people to remain calm and that "unconfirmed, unsubstantiated and unfounded reports can cause fear, anxiety and could actually cause or incite violence and public disorder". He went on to say at this point in time there are no confirmed deaths, but there are about nine students currently receiving medical treatment at the Port Moresby General Hospital. The injuries stem from a confrontation between Police and students at the University of Papua New Guinea's Waigani campus earlier today.